The game is over when both opponents pass. This rule often puzzles total beginners as they are not sure if a moment like this will come at all. Opponents pass if there are no useful moves left: which means that any move either does not change the score or changes it in an unfavourable manner. Since the players don't want to reduce their score, they don't as a rule do the latter . The situation is different with zero-value moves. It is considered bad manners to make them, simply wasting your and your opponent's time. Look once more at the position on the board with the dead stones marked. If you are sure that you understand that any next move has zero or negative value and why all dead groups are really dead then skip to PGB281. It's White's turn. Apart from a neutral point at a, White could put a stone in her own territory or in the territory of her opponent. Playing in her own territory, White decreases it. Naturally this is not in White's interest. Plays in the territory of the opponent can be of two kinds. If White plays 1 in the next diagram then another of her stones will become a prisoner and will be taken from the board and added to the captured stones in the black bowl cover. As the result Black will gain one more point. Naturally, White is not interested in that. On the other hand, there are some moves that create a threat. An example is shown in the next diagram. On White 1, Black has to defend with 2. Otherwise White will capture four stones, by playing at 2 or a. Thus Black has to play in his territory once, and decrease it by one point. 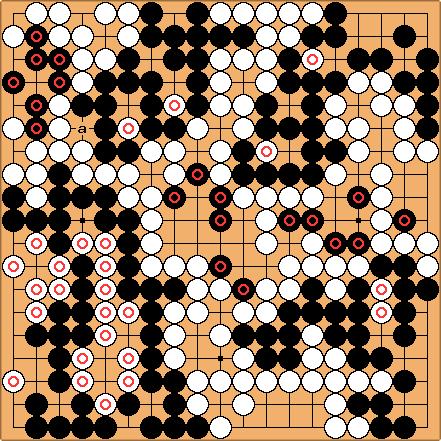 But White's stone 1 has become a prisoner, and so Black has gained one point. The net score did not change. Playing moves that do not change the score and only prolong the game is considered impolite. You show some disrespect to your opponent if you assume that he will not find a correct move in a situation like this. There are situations on the board in which you can't clearly see the consequences of your moves. Then playing inside the opponent's territory is justified. But stop it as soon as you clearly see that it does not work. Now we have to discuss a question about the status of the stones that were declared dead during counting. To be alive, a surrounded group of stones has to be able to form two eyes or kill some of the surrounding stones. Looking at the board attentively we see that all groups that were not marked as dead either have, or can form, two eyes; and thus cannot be killed. White's marked group is dead. To form two eyes White has to play both a and b. It is impossible to do in one move. If White plays 1 Black 2 takes away the possibility of the second eye. If White plays 1 here, Black 2 makes the eye at 'a' false. We have the same situation in the right bottom corner. 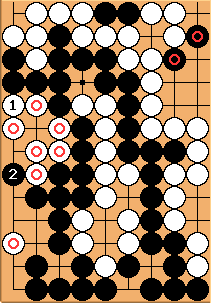 Adding one white stone increases the number of prisoners, Black's reply decreases his territory. Thus the balance remains the same. One Respects the opponent's ability to reply correctly, and these moves are not played. A situation in which two moves are interchangable like in this example is called miai. So, we've seen that any move either leaves the score the same or changes it unfavourably, white passes. Then Black, who does not see any useful move either, passes too. The game ends. We will step backwards 10 moves now to a situation where some useful moves are left; and we will see how one of the players could possibly change the score. We will use Japanese rules on this page. With Chinese rules the conclusions are the same but the reasons will differ slightly. Invading plays that do work are quite legitimate, of course. But play them when they are justified. Speculative plays played late on are a bad habit.